Being an entrepreneur can be equally rewarding and frustrating. Owning your own business, no matter how small, can provide a giant measure of enjoyment and personal satisfaction. I can personally attest to that. There is much that can be frustrating, though. One is the simple fact you can't do everything you want to do. 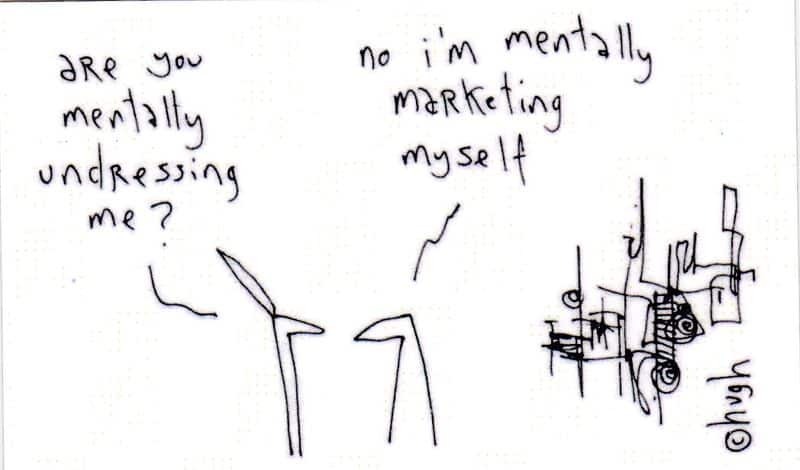 Take marketing, for example. Marketing is one of the two basic functions of business–innovation being the other. I didn't say that. Peter Drucker did. For small business the conundrum is which marketing tools should you use? We simply don't have time to utilize very many, and with hundreds, if not thousands, of different types of marketing tools available, how do you determine which ones are best for you? Email is the overused default tool of choice right now, which makes no sense. Social media–with the exception of YouTube and maybe LinkedIn–has yet to prove ROI for most B2B marketers. And our quiver oveflows with the myriad of other tools available. So the questions begs itself, what should a small B2B do? how do you figure out which tools to use? In both my own experience as well as working with dozens of small businesses, I've come to the conclusion there are six marketing tools that pretty much every B2B business should use and use well. This doesn't mean you can't embrace any other tools, but IMNSHO, you're making a big mistake not aggressively incorporating these in your marketing strategy. Direct mail is so effective, even the Internet's giants enlist it as a key part of their campaigns. I've personally received mailings from Google and Facebook. You can be more creative with direct mail. You can be more personal. It's easier to stand out from the crowd since so many "smart" companies have abandoned mail to go 100% online. You can easily measure results with direct mail. You can send personal letters, postcards (of all sizes), greeting cards, different shapes and sizes. Direct mail may be more expensive than clicking a button, but when used effectively it's potential return is much higher. Like direct mail, the power of video cannot be underestimated. It communicates your message far better than print or audio. You can use video for new product demos, sales messages, interviews, testimonials, personal messages, etc. YouTube is, obviously, the best place to upload and store videos. Videos can be easily tagged for searches. You can set each video to be available to the public, unlisted, or password protected. And now YouTube allows you to embed an annotation right in a video that when clicked takes the viewer to an outside webpage. An example of a great business video is Wasp Asset Tracking. These are an awesome way to stay connected to your prospects and customers. Regularly scheduled live webinars or webcasts (they're basically the same thing) can provide timely information, engage your audience, and create a personal bond with the market. There are a number of free and inexpensive webinar companies online. The most popular is probably GoToWebinar. For an example of a recent webinar I did for one of my clients, click here. Right now many of you are thinking, "Say what?" What's a landing page? Everybody has a website, right? And most companies put this regular corporate URL on all their marketing materials. But this is actually a mistake. You should set up a unique landing page for every different marketing message. For example, Royal Master Grinders wanted to showcase what they were exhibiting at IMTS 2012. They bought the domain www.Booth6646.com and designed a site and landing page specifically for that. You might be a great marketer and communicate like crazy with your marketplace, but you can't just be better than the competition. You have to be seen as DIFFERENT. 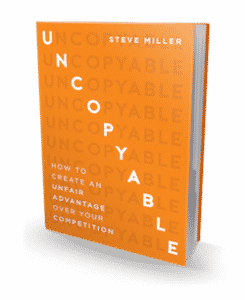 What promise can you make to people that clearly and definitively shows you are UNCOPYABLY SUPERIOR to the competition? Let's admit it. We wish ALL our prospects came to us as referrals, right? A referral is practically pre-sold for us and most of the time the sales cycle is far shorter. But despite how we love referrals, most of us do a crappy job of helping our customers refer us. Most companies don't have a formalized referral marketing strategy in place. How much sense does this make? And those who follow many "gurus" advice may actually be hurting potential referrals. I wrote about this my last blog post. I'm sure this is also raising a few eyebrows. Business cards? Why is this on the list? Pretty simple. 99% of all business cards look alike. We hand someone our card…they give it a cursory glance…and shove it in their pocket without a second thought. A great business card can truly separate you from the crowd. Your card can and should be indisputedly representative of you and your brand. People should look at your card and say something like, "This is cool!" They should talk about it with their peers. 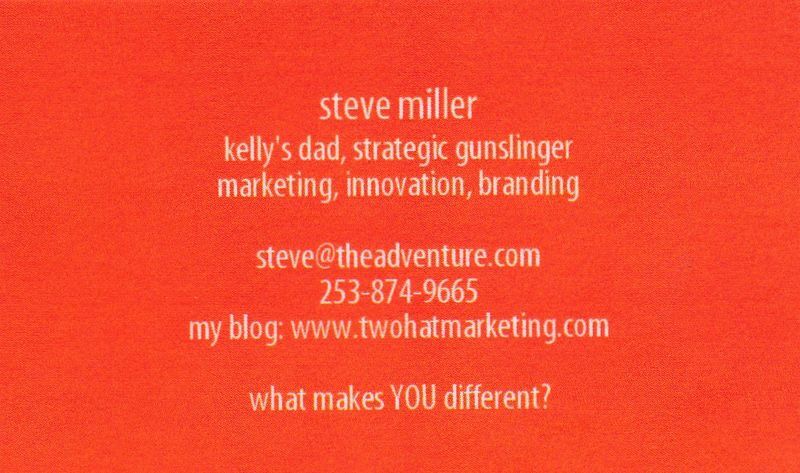 A great business card makes you memorable and unique. That's exactly what you want. 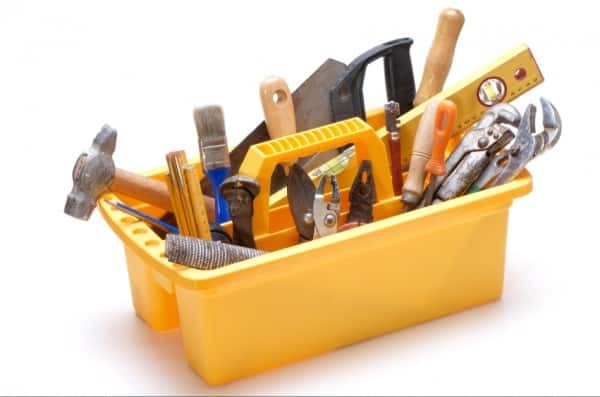 As I said, these 7 tools should be the basic minimum tools you use to market your business. By themselves, these may be all your ever really need. Of course, if you have the time to master each of these and feel the ned to do more, by all means do so. But these 7 are killer tools. You may not agree with me and I invite your comments below. Tell me what you think about my list and feel free to share other tools you are currently using. funny that you leave email out of your top-7, yet email is the reason why I read this post and I am typing this comment…. I was wondering when someone would make this comment, Bruce! I don’t include email for two big reasons. First, email is without question the most abused and misunderstood marketing tool out there. “Marketers” think they’re being smart by composing a sales message, clicking Send, and it’s blasted to thousands of unsuspecting recipients. Then they check their own inbox and click delete as fast as possible. Email is a great communications tool AFTER the relationship is established. And that’s #2. We have an established relationship, so you are willing to open and read an email from me. I didn’t get your name on my list by blasting a promotional email to you when we had no relationship. In your case, Bruce, you signed up to my list through my relationship with IMTS. Email can and should be used in communications after a relationship is established. But it’s a terrible tool to use for starting one. Where does social media marketing and optimization fall under?